Snehasish Mozumder is among those few established musicians in India who has mastered the art of playing Mandolin, and has blended it perfectly into the style of Hindustani Indian Classical Music. 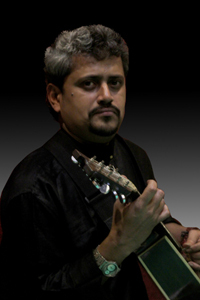 Coming from a musically oriented family,he started his initial training at the age of four with Tabla and then Mandolin under the guidance of his grand father late Sri Bibhuty Ranjan Mozumder and then he took training under his father Sri Himangshu Mazumder and his uncle late Sri Ranjan Mozumder.Gradually he switched over to his cousin SriTejendra Narayan Majumdar who is a well-known sarode player of the country. He continued his study under late Acharya Ajoy Sinha Roy who was a beloved disciple of Baba Allauddin Khan Saheb,the founder of Maihar Gharana and he takes lesson of laykari under the guidance of Pandit Anil Palit who is a senior most disciple of Pandit Kishan Maharaj, Finally he came under the tutelage of Pandit Ajoy Chakraborty.Snehasish, has performed many major festivals in India like Sankat Mochan Utsav of Varanasi Swami Haridas Sangeet Sanmelan of Mumbai, Indian Habitat Centre of Delhi, Bhowanipur Sangeeet Sanmelan, GolPark Ramkrishna Missionof Kolkata and Saltlake Music Conference of Kolkata e.t.c, and also he has toured Europe, U.K., and USA and made a very good name amongst the music lovers . Snehasish is the recipient of Surmani and Jadubhatta Awards. 27th Aaugust , 2007 - fusion concert at Knitting Factory of New York.